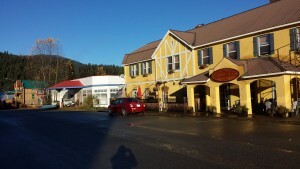 I spent Thanksgiving in the Cariboo town of Wells, BC (population 259) at the Northern Exposure conference. Here are my reflections on what we did, how we did it and what it enabled; in so doing I hope to draw the curtain back a little on effective design thinking-inspired meetings that help people move to the next level – whatever that is for them. Island Mountain Arts‘ ambitious conference attracted about 75 festival organizers, arts organization staff and volunteers and musicians from BC’s northern and southern interior, the Sunshine Coast, Vancouver Island, Haida Gwaii, and the Yukon. Island Mountain Arts (IMA – named after a local mountain, called Island) has been operating its renowned Summer School of Art since 1977 and over the years has expanded with a Public Art Gallery and Gift Shop, an International Harp School, the Toni Onley Artists’ Project and the award winning ArtsWells Festival of All Things Art. Julie Fowler, Executive Director of IMA, invited me to facilitate this conference, based on my previous work with SPARC – Supporting Performing Arts in Rural Communities and the Yukon Arts Presenters Summit. And she recruited co-presenters and panelists from across B.C. to ensure a wide range of perspectives. Speaking with Julie, we quickly established a common purpose: to build up a better networked rural festival and arts community. My approach as facilitator and presenter was focused on creating spaces for participants to get to know each other, share knowledge and know-how, and encourage collaborative learning and action planning. Julie and her wonderful team took care of conference logistics, meals and showcases – 16 in total – at the local Sunset Theatre and the Wells Hotel. She arranged two sessions tailored for musicians. The conference also had its share of great food by chef Sharon and the kitchen crew and a fine assortment of beverages at showcase and reception venues. Being in a small place, the conference moved as a whole from breakfast at the Wells Hotel to the Wells Community Hall for conference sessions, back up the street for lunch and showcases and then back for more learning. We shared dinner and conversations and then went off to the Sunset Theatre for showcases. A late evening snack invariably appeared at the Pub to maintain the stamina of musicians and participants alike. I feel that having participants move together in this way, sharing meals and conversations in ever changing configurations, made for closer connections and more meaningful, relevant learning. Participants during the audience development session. The pre-conference professional development day on audience development was attended by most of the conference participants. I delivered a well-honed workshop; modified as usual to suit the rural context. This session was highly interactive, with lots of conversation by all participants and practical learning. This was followed by a full slate of 15-minute 1-on-1 sessions with me. The nine participants brought a wide range of marketing and organizational questions to these intensive conversations. At the same time, Emma Jarrett, a performance coach, conducted a fantastic hands-on workshop for musicians and anyone else interested in honing their presentation skills. 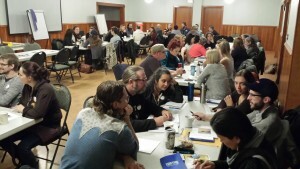 During the Let’s Get Connected process, participants had four 10-minute segments for reflection and conversation at tables of 6 each. A quick way to meet 20+ participants in an hour. All participants had their picture taken at registration. They recorded the information on their print outs and then discussed it with their group. Every 10 minutes a room full of participants stood up and found a new table of six to move to the next topic. It’s an amazing free-flowing choreography. With the sheets we created a Living Wall that served as a reminder of the breadth and depth of knowledge and experience each and every participant brought to this conference. It was a powerful beginning that I feel set the tone for a true working conference: Participants heard their own voices from the start; felt valued as experienced organizers; and they became collaborators in co-creating our conference. After a short coffee jaunt up to the hotel, I gave a well-received keynote on Co-creating a Culture of Place, in which I made the case, as I have at other conferences, for Vibrant communities fueled by the arts and its community-engaged partnerships. Much of the data in that keynote comes from The Value of Presenting study. This study continues to deepen the conversations about arts presenters and their role and impact in their communities. After lunch, I had the pleasure of working with Janet Rogers – a Mohawk/Tuscarora writer and broadcaster from the Six Nations in southern Ontario, who was born in Vancouver and has been living on the traditional lands of the Coast Salish people (Victoria, BC) since 1994 – to share information and lead a conversation on Cultural Tourism. I provided context and laid out a cultural tourism landscape. Janet led a conversation on how to access indigenous artists for festivals and events, and encouraged making the necessary contacts early in the event planning process. She proposed that in so doing we could move from the acknowledgement of traditional lands into meaningful inclusion and full participation by indigenous and non-indigenous artists. After all, Aboriginal tourism is seen as a key aspect of expanding Canada’s and BC’s cultural tourism potential. I felt this was an important and open conversation about an area many of us want to get right but also feel some insecurity about. These protocols are new to most event organizers. What excites me is that meaningful change can happen through our individual decisions and actions, by getting to know each other and speaking openly and respectfully to each other. We don’t have to wait until everything is figured out in the big picture. A small selection of our Living Wall. Concurrently, Music BC presented a session for musicians on all of the sources of revenue available to them for their work. I moved the programmed afternoon networking round tables outside to a walking conversation – thankfully the rain held off and the winds had died down. 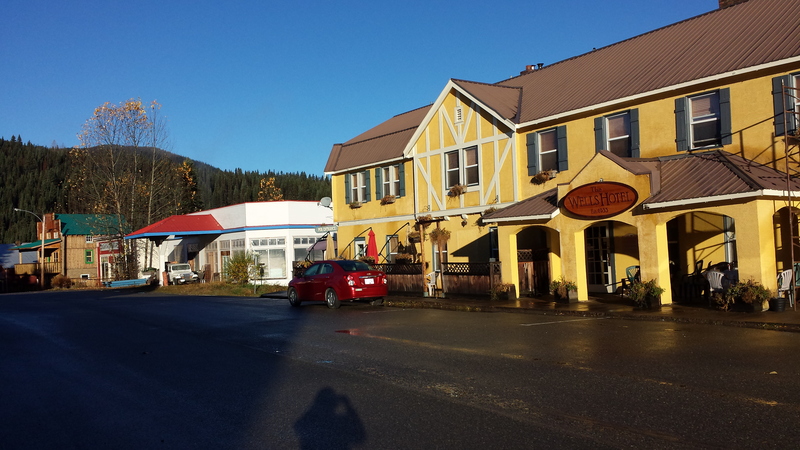 On the last day of the conference we were in Barkerville. The morning featured five inspiring stories presented by Julie Fowler, ArtsWells Festival/Island Mountain Arts; Carla Stephenson, Tiny Lights Festival; Karen Jeffery, Sunset Theatre; Deb Beaton Smith, Rifflandia; and Miriam Schilling, Xatśūll Heritage Village, Soda Creek. The panelists – participants conversation drew the curtain back a little on how to build success, how to sustain arts in small communities and the kind of perseverance, experimentation and serendipity it takes. 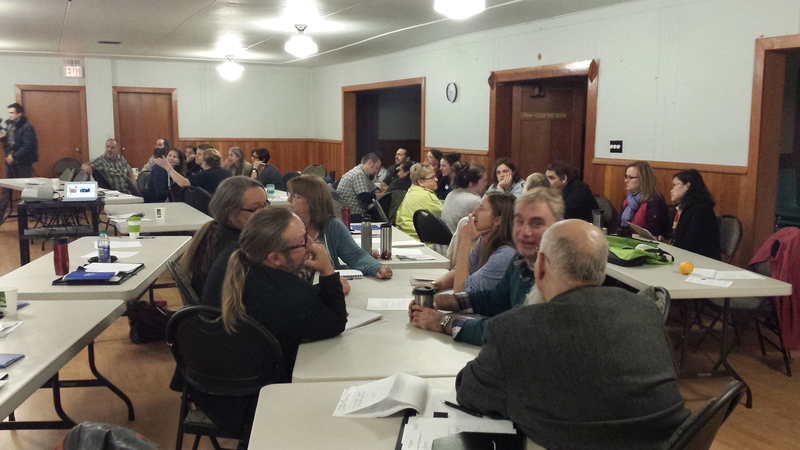 Everyone was eager to share their experiences and it felt like the perfect transition to move toward action planning. But first I led a practical workshop on integrated online marketing with Fraser Hayes‘ able assistance. Fraser is the station manager of CFUR Radio in Prince George; a community radio station that has built a substantial integrated online footprint to complement its broadcasts. More insights and specific action items tumbled forth and then we were ready for lunch, a walk about this amazing restored gold rush town and the final two showcases. The conference concluded with action planning. First I asked everyone to write down key take-aways from the conference, their next action steps and desired short and long-term results. The process requires participants to write the information out twice: one copy to take home and the second copy to be shared with participants. 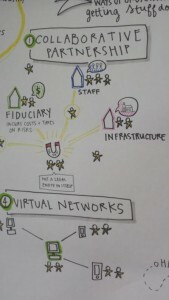 In this way we hope to facilitate network building. (I borrowed this format in condensed form from the Yukon Arts Presenters Summit which was facilitated by Jerry Yoshitomi.) Writing this down twice gives more time to reflect and form greater commitment to taking actions. This exercise moved seamlessly into a robust conversation around participant-identified topics. We collapsed about 10 (!) 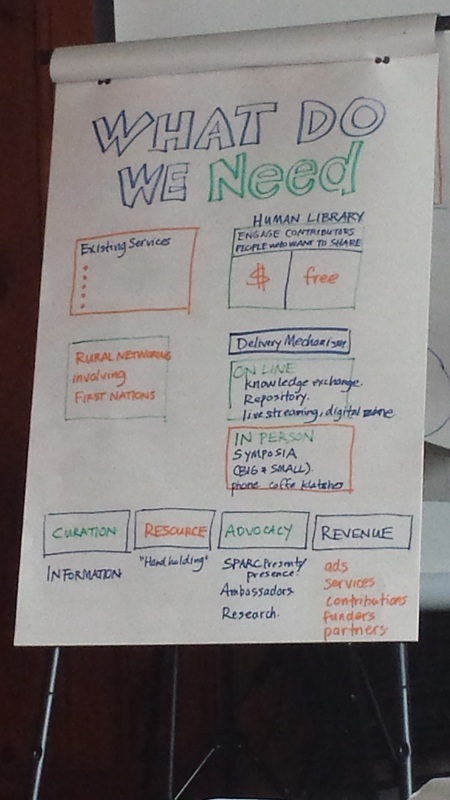 suggested topics into three broad areas: programming, operations and youth. Participants quickly gravitated toward their topic and a number of specific ideas for collaborations and resource sharing were brought forward. Finally, in closing, we ended as we began: with participants having the last word through sharing highlights from their own action plans. It seemed everyone felt confident that this conference was not merely the culmination of a long-standing dream, but that it would be the catalyst to move forward with closer ties between participants and their organizations from all over rural BC. While the conference concluded officially, conversations continued into the night as some participants stayed for Thanksgiving dinner and more pub time. More than a week after leaving Wells, these days continue to reverberate in me. I am grateful for the new connections, the new friends I made and for being part of this special community of festival and arts organizers. This entry was posted in audience, branding, collaboration, conference, conversation, innovation, leadership, network, performing arts, relationships, social media, social networking, strategic moves, strategy, Value of Presenting, vision, web and tagged Written by Inga Petri on October 21, 2015 by Inga. 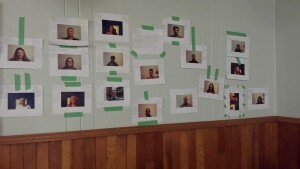 The successful SPARC – Symposium for Performing Arts in Rural Communities held in Haliburton, Ontario in April 2014 led to the desire to establish a network of people and organizations to strengthen performing arts in rural communities. The resulting SPARC Network Summit was held in November 2014. To meet the Steering Committee’s ambitious goals its members focused on creating the conditions in which all participants could explore, discover and define the next action steps in creating a new kind of network. Myself, because I know the performing arts nationally, I spoke at the first SPARC Symposium and am well-versed in design and delivery of complex facilitation requirements. Jim Blake, an experienced facilitator, artist and community development consultant who has been involved in SPARC since its inception as a member of its Steering Committee. Recruitment communications made clear that participants would be prepared to think about all the facets of creating a network, from the big picture needs to operational priorities. Happily, most of the about 25 Summit participants had attended the Symposium and carried over the great energy from that content-rich 4-day conversation into this Network Summit. Emma Lovell was the Summit’s graphic recorder. Jim and I designed these two and a half days of conversations using a design thinking approach that opened opportunities for exploration and creativity, analysis and synthesis, convergent and divergent thinking. 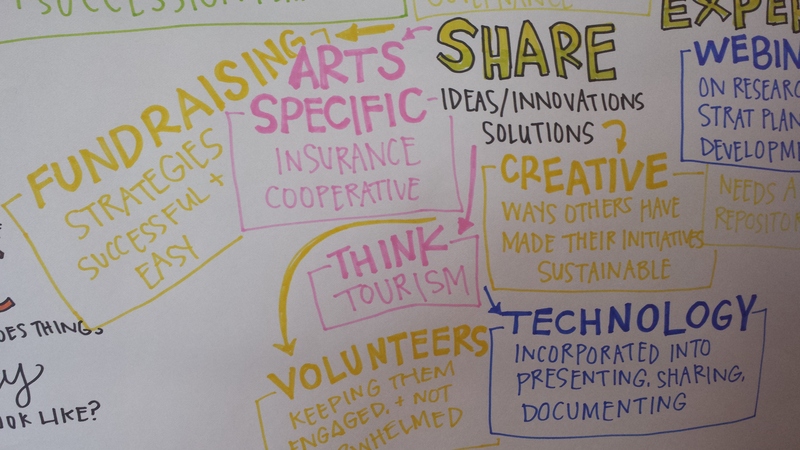 There was no pre-defined destination, no right answers, but rather a general goal – strengthening the performing arts in rural communities – and deliberative processes that ensured all participants had a voice and used it. Friday evening was devoted to rekindling connections from the April Symposium and introducing those who were new to SPARC through conversation and sharing food. Saturday was devoted to exploration: The facilitators led participants through a series of working sessions designed to explore important questions about issues participants faced that held them back in realizing their visions in their work, what kinds of gaps currently existed, what SPARC as a network might do in response, how it might operate, who it would be for, how the network could be activated as a valued resource, what participants could contribute to a rural network and what they needed from it. Through a series of structured and unstructured work in pairs and small groups participants explored, discussed and debated these questions and arrived at identifying existing gaps and key opportunities for SPARC moving forward. This was followed by dinner conversations and sleep. Well, some also had a great time at a Harry Manx concert. Sunday was devoted to decision-making and next steps: The co-facilitators presented outcomes from Saturday’s exploratory work for validation and feedback. Through plenary conversation and another round of small group discussion, participants came to agreement on several key decisions to move the SPARC network forward. keep SPARC agile, open and responsive by keeping its current structure as a collaborative partnership and build out its foundations through expanding partnerships. As a collaborative SPARC does not exist as a separate legal entity, but rather uses its partners to provide the requisite financial management, office space and infrastructure, knowledge and people. 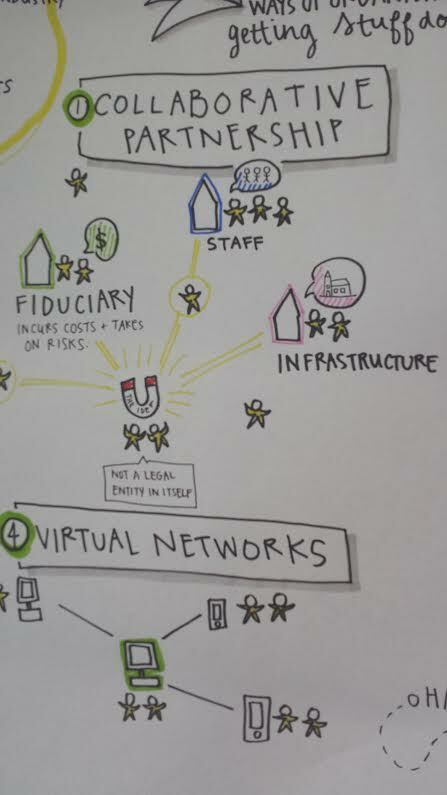 keep the Network’s focus on Ontario, while sharing developments with other rural regions/networks with the intention that SPARC could become a model for a national rural network to connect hubs across Canada. 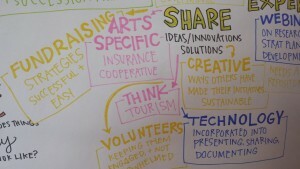 presenting a session at the Canadian Arts Presenting Association’s (CAPACOA) national conference in Halifax in January 2015.
publishing an interactive report of outcomes using the various modes of recording the proceedings (video, a graphic recorder, many flip charts and worksheets) in early 2015.
investigating funding for a series of regional working sessions/consultations across rural Ontario in 2015-2016. This entry was posted in collaboration, conference, conversation, innovation, leadership, performing arts, relationships, social networking and tagged Written by Inga Petri on January 5, 2015 by Inga. Imagine: creating a brand new genre of live music making today! Yes, as if it was brand new. Where would you start? I would start with looking at my potential audiences and what they thrive on today. I would look at my community, its demographic make-up, its values, attitudes and beliefs and I would segment. I might identify those huge numbers of people who listen to music electronically, primarily using ear buds, irrespective of genre. I would examine deeply where they find their music, what they are listening to, how they listen to this music, when they listen to it, whether they share it with others and how, why they listen to their music, what music gives them, and what music gives them that nothing else in their lives does. Then I would find out how they spend their days, how much time they spend being social and what they gain in their social interactions. I might see that there are grave pressures and stressors in people’s lives, and a wide range of worries and concerns that express themselves in various ways, including making people sick, feeling isolated and alone. I might think about how their current consumption of music via ear buds enhances these issues or alleviates them. Then I might realize that the highest potential revenue is available in the 30 to 59 year age group – according to Statistics Canada data. I would use an existing geographic segmentation tool to understand demographics, values, attitudes and beliefs by postal codes, allowing me to see many dimensions of potential audiences. I might determine that there are two different generations in this 30-year age span – Boomers and Gen Xers – who hold different generational values. I might decide that Gen Xers would be the sweet spot as they are less individualistic in orientation and I could foster and keep them as customers longer because they are younger. I would do this knowing that they tend to be more independent-minded even as they value communal spaces and social connections. I would see that my target Gen Xers create, participate and engage in every dimension of life (socially, environmentally, politically, economically, artistically). I would see that they are sophisticated consumers who research, explore and sample online and by recommendation (both peer and paid recommenders). They are curious about new experiences and are excited to try out things they haven’t done before. I would see that they tend to look to be entertained in a friendly atmosphere rather than simply accepting others authority and doing as they are told without knowing why. Then I would find out where this generation spends time and what their days, evenings and nights look like. Are they indoors in front of large screens or having family and social time, are they on the run using mobile devices as a primary interface while working hard, are they hanging out in coffee houses, bars and restaurants to get face-time, as they also chat and engage in social media to share with their wider community, are they in Yoga studios and fitness studios, spas and aesthetics shops where pampering is the order of the day and image is honed? Or do they work and worry about having enough money and resources to make ends meet? Different segments, micro-segments, would dominate in various activities and I might decide that I want to provide my solution – live orchestral classical music (ha!) – to all of them or some of them. Then I might ask myself: how can I connect my brand new idea, never been seen before type of music making requiring perfect harmony among 40 to 100+ (!) musicians to these Gen Xers? How is my idea, that thrives on delicate sound (both in the highs and lows – qualities that are harder to appreciate and hear in compressed digital files), complex structure and intricate music making with a bewildering array of instruments, going to make these sophisticated, busy Gen Xers’ lives better, richer, more complete? What is the value Gen Xers would gain from such a formidable live experience? How is that value greater in comparison to other activities in their lives? How do I connect this live experience through online/mobile channels and make it irresistible? How will I secure true participation in the live music making? Then I would decide what the business model is going to be, after all, getting that many musicians to play together will take considerable resources especially in the mid- to long-term. In essence, I would think about whether there can be economies of scale in my business model and what they are. For instance, I might realize that the live performance doesn’t scale well and I might search for ways to extend the live aspects to further monetize them. I might borrow from the playbook of other live events, whether its sports or pop and rock music. I would look to other music experiences for inspiration, from the house concert to the stadium rock concerts. I would also look to the video game industry because it is highly participatory, the high-end spa experience because it does so well at pampering and getting me beyond my daily concerns, and the travel industry, both packaged and independent travel. And I’d think about styles of performance a lot. This would eventually get me into the weeds of decision making: Would I put the musicians in a closed music making space, a concert hall, or would I put them outside or in community contexts? Would I have musicians be perfect technicians playing all the notes just so, or would I think about all that’s needed for an awesome performance experience for the audience? Would I ban the enthusiasm of my audience to the ends of long pieces, or would I encourage spontaneous outbursts of joy, delight, feedback? Would I dress musicians in black tails or would I allow their personalities to shine through with more than their hair styles? I would deeply consider the trade offs in each decision, talk to musicians and audiences and figure out how they would shape my brand. Building such a bold idea from scratch would be awesomely exciting. Finally, I would figure out how to build-in “creative destruction” mechanisms, so that the audience experience stays fresh and vibrant, rather than becoming narrowly defined by my initial magic formula. Everything tells me that there will be significant disruptive factors of all kinds, most of them outside my control, so that I might as well build in change and evolutionary leaps into the DNA. This entry was posted in audience, competitive intelligence, customer insight, innovation, performing arts, relationships, research, social media, social networking, strategy, vision, web and tagged Written by Inga Petri on February 7, 2014 by Inga. Or in plain language: what are 4G speeds on LTE networks which started to come online in Canada in 2012 going to enable for theatre goers and dance attendees as well as presenters and producing companies? During the first year of conducting Value of Presenting workshops there was little appetite to consider anything but the utility of social media in selling tickets. A breakthrough happened at the CAPACOA conference in January 2013 and now it feels like more and more presenters are beginning to see that web-based mobile technologies are going to create leaps in value for audiences and perhaps artists, producers and presenters. We presented at the Creative City Summit in Ottawa in May 2013 what we found out from Canadians and presenters about their use and attitudes to digital technologies and how Canadians’ views of what “live” means to them might be evolving. At APAP|NYC we presented on this topic (PDF) this month as well and just last week the 2014 CAPAOCA conference featured a successful workshop with presenters on the opportunities, the values of both streamed and live experiences, facilitated by Frederic Julien from CAPACOA. Watch this Youtube video by Alcatel-Lucent which was created in 2009 (!) to demonstrate their technology vision and emerging capabilities. The final minute shows a vision of a performing arts experience, begging for a presenting business model! What will the successful strategic move look like? This entry was posted in business, customer insight, Digital Innovation, innovation, performing arts, research, social media, social networking, strategic moves, Value of Presenting, vision, web and tagged Written by Inga Petri on January 16, 2014 by Inga. 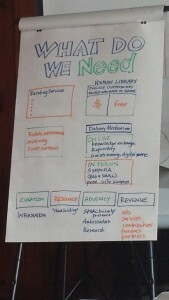 This entry was posted in collaboration, conference, conversation, innovation, performing arts, research, social networking, strategic moves, Value of Presenting, vision, web and tagged Written by Inga Petri on May 31, 2013 by Inga. This entry was posted in collaboration, conference, conversation, innovation, social networking, Value of Presenting, vision, web and tagged Written by Inga Petri on May 30, 2013 by Inga.